“For the last seventy years—ever since his show-trial in 1946—Alojzije Stepinac, Cardinal Archbishop of Zagreb, has been the subject of controversy. In this book, Robin Harris explores recently available original sources, including Secret Police files stored in the Croatian State Archives, to find out the truth. Stepinac led the Catholic Church in Croatia during dangerous times. As a young, untested Archbishop, he confronted authoritarian rule under the First Yugoslavia. After the Axis Powers invaded in 1941, he struggled to steer the right course through the bloody chaos of the Second World War. For the last years of his life, in prison and then interned in the parish where he was born, he inspired the Croatian Catholic resistance to Communist persecution. Stepinac shared the fate of other Church leaders, like Cardinal Mindszenty of Hungary, who were vilified and imprisoned by the new Communist rulers of Eastern Europe. But the campaign against him, originated by the Communist Party, was, and still is, exceptionally ferocious and persistent. Accused of complicity with War-time atrocities, the Zagreb Archbishop’s role in this period is also important in the wider arguments about that of Pope Pius XII. Stepinac often had limited room for manoeuvre. A deeply spiritual man and never regarding politics as his metier, he had to calculate the best way to save lives when violence threatened, and to preserve the Faith—and loyalty to the Holy See—when Tito worked to destroy both. Pope Saint John Paul II beatified Stepinac in 1998. The canonisation was announced as imminent—until the leadership of the Serbian Orthodox Church protested to Pope Francis. 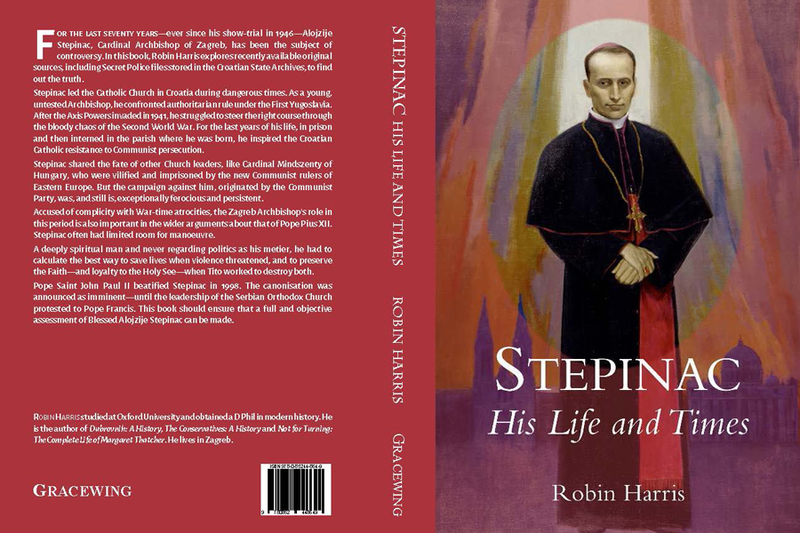 This book should ensure that a full and objective assessment of Blessed Alojzije Stepinac can be made,” writes gracewing Catholic publishing of UK on its website. Emphasising the importance of this book in the English language Croatian Catholic University Rector Zeljko Tanjic said Friday 21 October at the Universiy’s launch of Harris’ book that the book was the fruit of a lovely friendship between Dr Robin Harris and two Croatian cultural greats based in London – Chris Cvijic i dr. Branko Franolic, to whom the book is dedicated. Rector Tanjic said also that the fact that Dr Harris has recently become a lecturer at the faculty of history of the Croatian Catholic University presents a very high honour for the university. Furthermore, Tanjic said, the book is equally the fruit of the author’s longstanding studying and research into documentary evidence pertaining to Stepinac’s life and the times he lived in. Dr Tanjic reiterated that Harris’ book represents an exceptionally important contribution to the Croatian national and religious history. The contents of the book are spread across 409 pages, 12 chapters as well as four interesting addendums: Stepinac’s speech in the court; the list of a number of officials in the administration of the Kingdom of Yugoslavia during 1930’s according to their religious belonging; a text that explains whether Stepinac was poisoned and Stepinac’s spiritual testament in the English language. This is a complete biography of Alojzije Stepinac in the English language, the first after 25 years of Croatian independence and according to Dr Tanjic, copies of this book should be held at all Croatian diplomatic and consular missions across the world, it was after all written by a competent author and being written in English it contributes to the internationalization of Alojzije Stepinac’s canonisation process in the context of the mixed commission of the Catholic Church and the Serbian Orthodox Church which is addressing the issue. Harris especially thanked the Croatian Cardinal Josip Bozanic and mons. Ivan Sasko for the support they provided to him in writing his book. 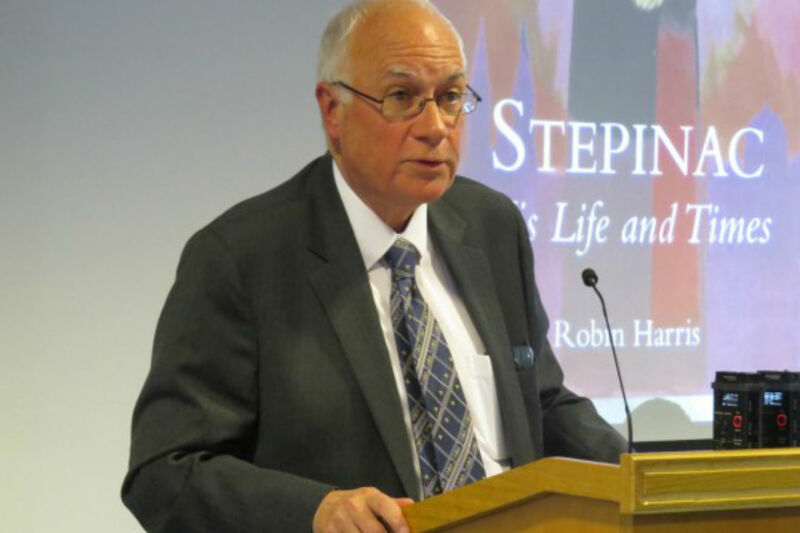 Robin Harris emphasized that to him as a historian the truth has always been paramount and, hence, the aim of his book from its beginnings had always remained the same – research, understand and describe the truth about Stepinac. Stepinac’s life has been the subject of most detailed studies because of the many malicious allegations against him, from the rigged court process (in 1946) till today. “From all the collected sources today we know that Stepinac justifiably said at the end of his trial: ‘I say publicly before the whole of the present public, even if that public laughs, before the diplomatic core, if any are present, before the foreign journalists – if I really am convicted, I say before God that I have been convicted as an innocent, my conscience is clear and the future will show that I was right’,” Harris emphasised. Harris said that there are many lies and untruths about Stepinac. 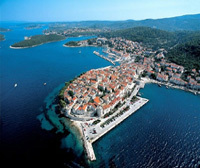 It is not important only for Croatia and the Church, but the world, to know the truth and that is my aim. With regard to availability of some documents in Croatian archives, Harris stressed that this was a general problem because archives about communist crimes are still confidential, which he said is shameful and unacceptable. I think that we know everything that is important to know about Stepinac however, it is shameful that those archives have not been completely opened. That isn’t a matter of lustration, but of realising the truth and cleansing society, Harris said. Further to contributing towards Stepinac’s canonisation process Rector Tanjic announced the coming presentation of the book in both the Croatian and the English languages, with summaries and excerpts in Italian, of the works and presentations put forth at last year’s forum in Zagreb called “Arxhbishop Stepinac and the Serbs in Croatia in the context of Worl War II and post-WWII”. I have just announced to the Croatian parliament that I wish to be considered for the position of private secretary to the president. I was arrested, beaten, and thrown into the street. I think they are considering my offer but don’t wish to appear too eager. This book would be great addition through Catholic retail stores and websites here in the US! Great respect to Cardinal Stepinac . Through faith and prayer , he always spoke worked and lived a life in truth . Despite all the obstacles and injustices he faced . Many blessings to his wonderful Soul . Slightly off topic , but relevant these days . If you have time , read a short article by John W. Whitehead . 24.10.16 . A GOOD BOOK ABOUT A GREAT MAN. This sounds like a fascinating book on Bl. Alojzije Stepanic. He’s one of the more controversial candidates for canonization because of accusations of cooperating with fascists during WWII. In that regard, he’s very much like the much maligned Pope Pius XII. 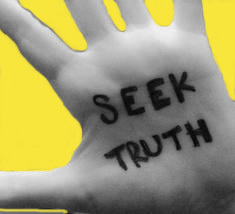 In either case, one will find that the accusations are part of the communist plot during the Cold War to discredit the Church. I’m happy to see that a scholarly work has come out on Bl. Stepanic’s life which addresses this issue. That’s exactly right. I look forward to the day when Stepanic is canonized. A saint and a martyr for the Catholic Church not only in Croatia but the entire world. Thank you for posting this Ina and for Mr. Harris for writing this important work in ENGLISH! Too many good books and films in Croatian are NOT translated. This should be the job of the Croatian Ministry of Culture, which will now sadly be run by reds yet again. Blessed Stepinac pray for us!